Juicy chicken, sweet smoky tomatoes and all made in the oven. 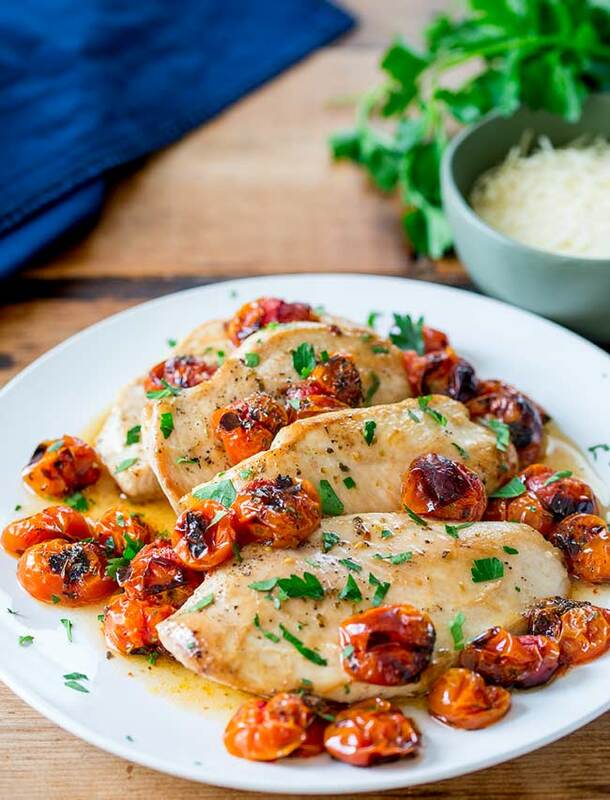 This Mediterranean inspired Baked Chicken with Cherry Tomatoes is packed with flavor and so simple to prepare. Plus as it cooks in the oven it is a handsfree dinner AND ready in under 30 minutes! 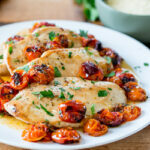 This Baked Chicken with Cherry Tomatoes really is a simple and delicious chicken dinner, everything is cooked together in the oven and all that is left is to prepare a few quick sides. To ensure the chicken cooks quickly I like to fillet it. Filleting a chicken breast involves cutting it through the middle so you end up with two smaller breast fillets or cutlets. To do this you lay the chicken flat on a chopping board and use a large knife to cut horizontally through the chicken breast. By keeping the knife flat and parallel to the chopping board you will be left with two chicken fillets. The flavors in this chicken are reminiscent of the a Cacciatore, only fresher and much more fitting with spring and summer. But that Italian flare means this chicken is perfect with a sprinkling of parmesan. And don’t forget the fresh parsley, it isn’t just a garnish here, it enhances the brightness of the tomatoes and really makes this taste of fresh just picked vine tomatoes. The flavour from the roasted tomatoes is sweet and smoky, so I like to serve this with a crisp green salad and some warm crusty bread. It makes the perfect late summer dinner and that is when tomatoes are at their sweetest. Winner winner chicken dinner. What wine to serve with this Baked Chicken with Cherry Tomatoes. To balance the acidity and sweetness of the roasted tomatoes, plump for either a light red like a Montepulciano or a crisp white like a Verdicchio. Check out all my Chicken Recipes. 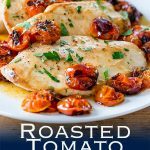 Juicy chicken breasts, sweet smoky tomatoes and all made in the oven. 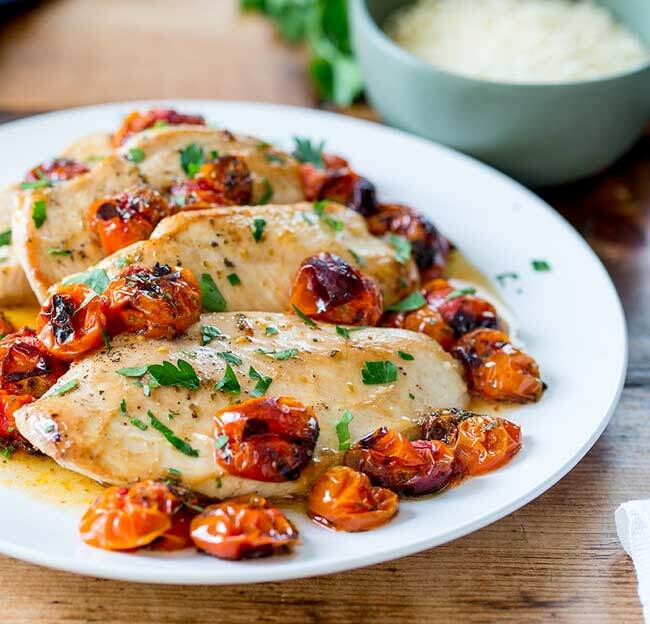 This mediterranean inspired Baked Chicken with Cherry Tomatoes, is packed with flavour and so simple to prepare. Lay your chicken breasts flat on a chopping board. 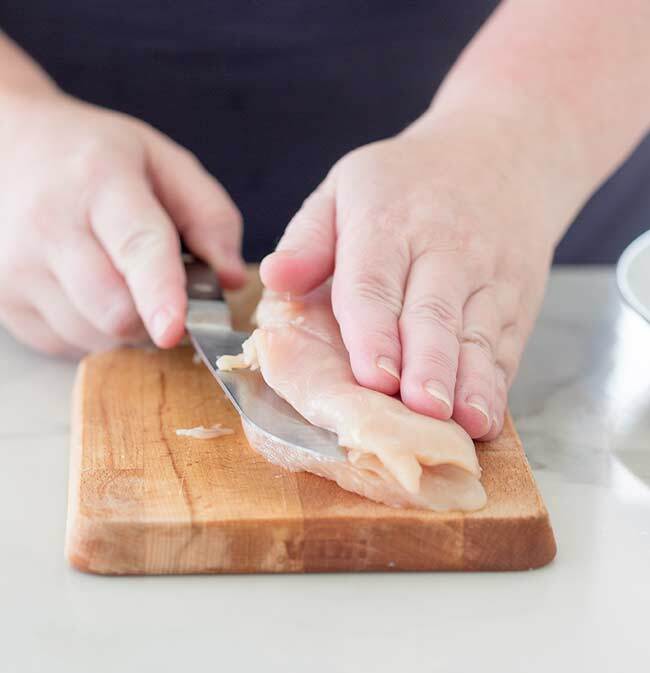 Use a large sharp knife to cut sideways through the breast, keep the knife parallel to the chopping board and continue to cut through the chicken breast until you have two fillets. Repeat with the second chicken breast. Lay the chicken flat on a plate, cover and refrigerate until needed. Combine the whole cherry tomatoes, olive oil, herbes de Provence, sugar and salt in a large bowl. Toss to ensure everything is well mixed. Season the chicken fillets with salt and pepper. Line a baking sheet with greaseproof paper and arrange the chicken fillets in a single layer. Tip the tomatoes into a shallow roasting dish. Bake for both dishes 15 minutes until the chicken is cooked through and the tomatoes have started to blacken and release their juices. Serve the chicken breasts drizzled with all of the juices and chopped parsley. The sun is setting and the bubbly is flowing, 4 friends sat outside, watching the sun sink lower in the sky, making the water glow pink and orange; so beautiful. There is a plate of hor d’oeuvres on the table and the conversation is in full flow. As you sneak away to put the chicken in the oven you can hear the faint sound of the waves lapping against the rocks. A weekend by the lake, just what is needed after such a busy summer. Time to unwind, relax and enjoy the company of your 3 best friends. The dish is ready to go, so you slide it into the oven, set a timer and slip back to join the conversation. More bubbles, more giggles and plenty of memories. As the timer buzzes the light is low and the candles get lit. The sweet smoky smell of roasted tomatoes fills your senses and you remove the golden chicken and blackened tomatoes from the oven. Transferring it to a large platter, you quickly toss the green salad and cut large chunks of crusty sourdough bread from the cute bakery just outside of town. Dinner is served and 4 friends get back to catching up. 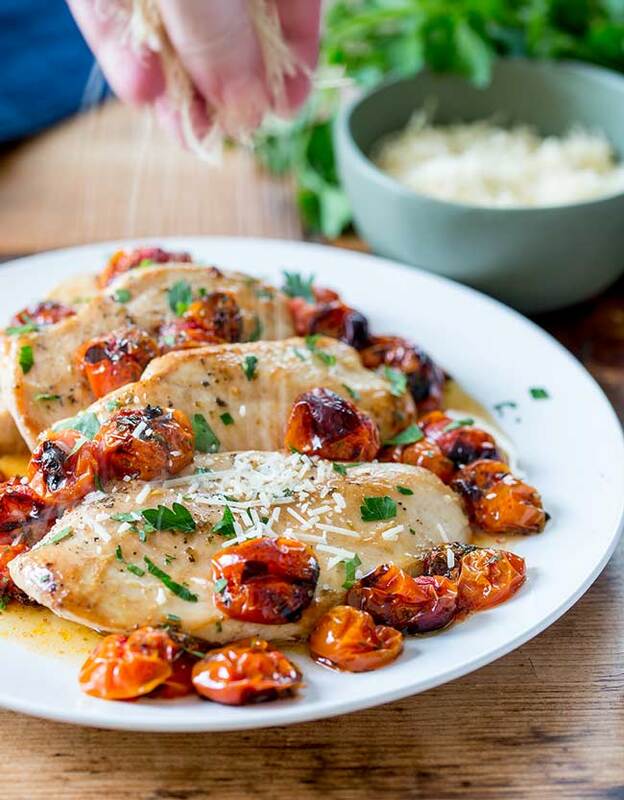 If you love food why not subscribe to my newsletter, I will drop you an email every now and then, just to say hi and send you a couple of recipes think you might love, like these Roasted Tomato Chicken Breasts. This is definitely my kind of cooking! It sounds delicious and I can see this making its way onto my weekly meal plans! And if you serve it with bread and salad….nothing else to cook…winner! Oh my gosh! This chicken looks so good! I have to try it soon! I love the description of your girls night, it makes me want to have my own (I’m long overdue for one) and I’m definitely going use this recipe when I have mine. It is good to just hang with your besties from time to time. I think it makes me calmer and more ready to deal with everyday stresses. This looks So amazing! Love that you showed all the great steps AND the wine pairing! HELLO DINNER! This sounds so perfect for tomato season! Such a lovely idea! 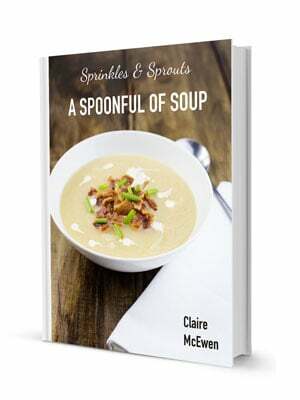 Claire, this is one scrumptious chicken recipe! Perfect for a weeknight or even for company! Oh my – those roasted tomatoes look like PERFECTION!